Oh my golly, have a creepy crawly Halloween this year with the Batty for You Set! Pair the images in this set with the 1-3/4" Scallop Circle Punch to achieve the same layered look. 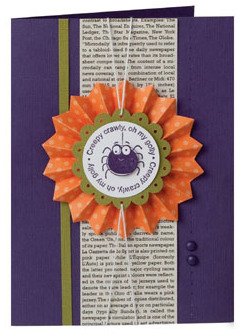 You can also create crazy tags or accents for cards or scrapbook pages with the adorable images from this set. It coordinates nicely with the Bring On The Bats Jumbo Wheel and our Frightful Sight Designer Series Paper for a monstrously fun combination. Nice post! I love the choice of colors.